Important Public Announcement: Did You Know April Is Esophageal Cancer Awareness Month? « April 17, 2012–Equal Pay Day Again. Ho Hum. What Would Gloria Steinem Say? I didn’t. And I should. Why? Because I am in the business of preventing esophageal cancer by controlling acid reflux disease in kids. The picture you see is what an esophagus (the swallowing tube) looks like before it becomes a cancer. This is very rare in children, but not so rare in adults. Looks pretty awful, doesn’t it? I am sure many of you didn’t know that little kids spitting up, or little boys burping, “you know the way little boys do,” or some kids who have a wet barky cough all the time or won’t sleep but an hour at a time for months or years on end or a runny nose non-stop (practically from birth) even with many courses of antibiotics, really have acid and other nasty stomach contents coming up and causing all sorts of these problems. It’s the airway problems, such as refractory asthma or airway narrowing, that can be really worrisome. And these are the airway problems that affect a large portion of the patients whom I treat. Esophageal cancer rates are increasing faster than the rates of any other cancer in the world–over 400%. Esophageal cancer is occurring more frequently at a younger age (the youngest known case is a 19 year old male). 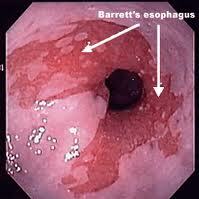 Esophageal cancer is highly linked to gastro-esophageal and extra-esophageal reflux disease. These are different problems. GER (gastro-esophageal reflux) goes from the stomach and into the esophagus (swallowing tube). EER (extra-esophageal reflux) goes from the stomach, through the esophagus and up and out into the nose, sinuses, voice box, windpipe mouth and throat and sometimes into the lungs. The effects of medications are not fully known so dietary therapy and life style changes are essential components of treatment. My advice is to teach your children to eat well and to take care of their tummies and the rest of their bodies. But there are some kids who, even with excellent diets and good eating habits, will continue to reflux. Talk to your primary care physician. Sometimes a specialist needs to get involved. Most importantly, if your doctor tells you that your kid needs to eat differently, lose weight or change some activities, please, please listen. It might bring on more than a few tears now, but later on it might save his or her life. I hope you found this helpful. At least I feel better now. This entry was posted in Ask Linda, On the Job, Worthy Causes. Bookmark the permalink. Post a comment or leave a trackback: Trackback URL. Thanks for this post, it really painted a clear picture of the importance of controlling acid reflux disease in kids. It seems so common that most kids have some sort of reflux but the dangers of having gastro-esophageal and extra-esophageal reflux disease is so scary. I was shocked to hear that Esophageal Cancer is on the rise all over the world, how devastating. Definitely something parents need to take serious to avoid long term problems. I know it sounds scary. I hope not too much, though.